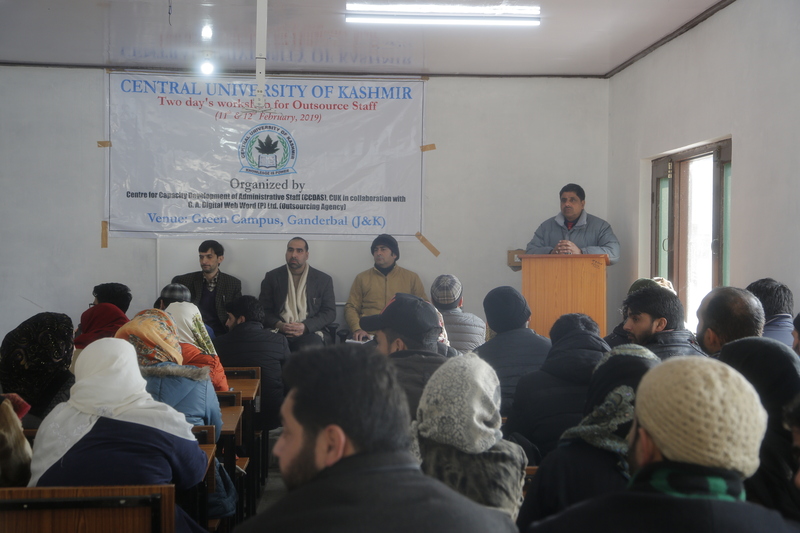 Ganderbal: The Centre for Capacity Development of Administrative Staff (CCDAS) of the Central University of Kashmir (CUK) in collaboration with G. A Digital Web World Pvt Limited (Outsourcing Agency) started a two-day workshop for Outsource Staff of the varsity at Green Campus here on Monday. Speaking on the occasion, Vice-Chancellor, Prof. Mehraj ud Din Mir, asked the participants to hone their skills during the workshop and gain knowledge from the work experiences of the experts, who will deliver lectures on diverse topics related to the functioning of the university. Prof. Mir asked the employees to work with utmost dedication, commitment, honesty and ensure punctuality so that the university would become a higher educational institution par excellence in the State of Jammu and Kashmir. “These attributes should become hallmark of your work in the university and you should continue to improve upon the same,” Prof. Mehraj ud Din Mir said, adding the university was seized of the issues confronting the outsource employees and is taking slew of measures to redress them. He asked the employees to work in tandem and in close coordination with the faculty and other administrative staff of the varsity. Registrar, Prof. Fayaz A Nika while speaking on the occasion asked the outsource employees to contribute immensely for the overall growth and development of the institution. “Every employee is important in the university and has a hidden talent. The main aim and objective of organizing the workshop is to find the talent of the employees so that they could put it to use and significantly contribute for the overall progress of the institution,” Prof. Fayaz A Nika said. He asked the employees to work with more zeal and zest in association with other staff members of the university in order to achieve the required objectives and goals set by the university. He further asked them to be student friendly. Deputy Registrar, and Coordinator, CCDAS, Dr. Javid Wani while welcoming the participants said the aim of organizing the capacity development programme was to sensitize the staff about the functioning of different departments and sections in the university. He said the CCDAS has been constituted for holding regular workshops for upgrading the skills of the staff. Deputy Coordinator, CCDAS, Mr. Imtiyaz Parray conducted the programme proceedings.